Make that old tile look like new again! Desert Tile & Grout Care provides professional cleaning and color sealing services for ceramic and porcelain tile and grout. Your imagination is the limit for an upgraded look in your home! Recolor your grout for consistency or to match the decor of your home! A wide range of colors are available – protective seals can also be applied with color. The Spanish style homes popular in Arizona often contain an abundance of tile. Ceramic tile is both beautiful and durable; it can last as long as your home, but it isnt completely maintenance free. Dirt adheres easily to the surface, especially styles with textured surfaces. Eventually this dirt that collects in the tile will dull and discolor it, leaving it looking old and dirty. Tile requires periodic deep cleaning and maintenance to eliminate deeply penetrated dirt and stains. Ceramic tile grout is much more vulnerable to problems than the tile itself. Unsealed grout is basically sand and a small amount of cement, leaving it susceptible to all sorts of stains. Any spill will be quickly absorbed and can leave behind a permanent stain. Tracked in dirt can also leave behind stains. 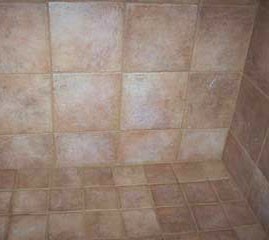 Bathroom ceramic tile grout, whether on the floor or the walls, is prone to collecting mildew and mold. Professional Mesa, AZ tile floor cleaning and color sealing of your Mesa ceramic tile and grout can bring back its original beauty and help to keep it that way. If your grout is discolored and stained or, if you wish to change the color of your grout, it can be cleaned, colored, and sealed. A new color grout can give the appearance of a whole new floor. Furthermore, color sealing will prevent moisture, dirt and grime from being absorbed into the grout. All grout is porous and should be sealed. The ceramic tile itself generally does not need to be sealed as most ceramic tiles available today have matte, shine free finishes, yet they are in fact glazed and will not accept a sealer. A ceramic tile floor is a gorgeous addition to any room, giving it a look of luxury that is hard to match with any other type of flooring, and once the grout is sealed it is fairly maintenance free. It should only need an occasional damp mopping with a neutral cleaner to retain its beauty. If your ceramic tile is discolored or dirty, your may consider hiring a professional. Desert Tile & Grout has served home and business-owners in the Phoenix Valley and surrounding areas for years, and our company has a well-earned reputation of providing reliable and quality services.